At Community Life on October 26, students had the privilege of hearing from Holocaust survivor Dr. Edith Eger. In 1944, Dr. Eger and her family were sent to Auschwitz, where she endured the loss of her parents and brutal treatment until being rescued by American GIs at the end of the war. After marrying and immigrating to the United States in 1949, Dr. Eger raised a family and earned a Ph.D. in psychology. At the age of 90, she still operates a clinical practice, primarily supporting individuals with post-traumatic stress disorder. 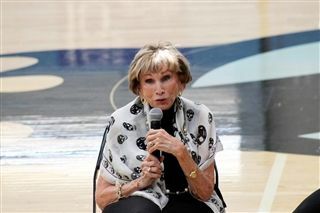 Dr. Eger shared with students her wisdom, optimism and vitality, along with her extraordinary survival story. To watch Dr. Eger's presentation at a 2012 TEDx program, please click here.